Last year's Nvidia Shield portable was the most powerful Android gaming system on the market at the time. The Nvidia Shield Tablet is the most powerful Android gaming system on the market, but it's also something its predecessor was not — useful. The original Nvidia Shield, rebranded the Shield Portable in the wake of the tablet's release, was a worthy but misguided attempt at championing the cause of Android gaming. Essentially a small Tegra 4-powered tablet affixed to a game controller, its form factor rendered it at best unwieldy, at worst completely useless for doing anything other than playing games. And while it did feature the ability to stream PC games from a system outfitted with the appropriate Nvidia graphics hardware, it wasn't enough for many to justify spending upwards of $300 on such a niche piece of equipment. There was promise to the Shield concept however, and the Shield Tablet is that promise fulfilled. The Shield Tablet delivers all of the functionality of the Shield Portable in a far more pleasing and practical package. Instead of a bulky clamshell creature that screams awkward gaming, we've got a sleek black 8-inch tablet. The 5-inch, 1280 x 720 display of the portable gives way to a 8-inch 1920 x 1080 LCD. The impressively powerful Tegra 4 processor is gone, replaced with the ridiculously powerful Tegra K1, nearly four times faster. 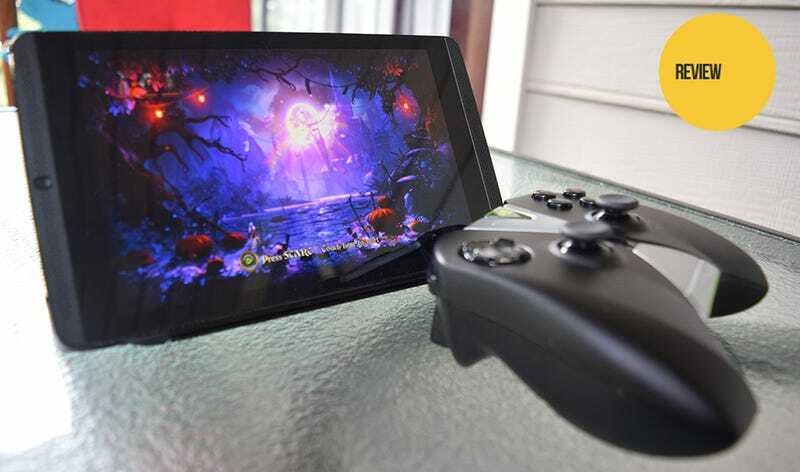 The most powerful Android tablet on the market, the Shield Tablet easily handles any game Google Play can dish out, while retaining the ability to stream PC titles using Nvidia's GameStream technology. Hook it up to a television or monitor via its mini HDMI port and it'll output up to 4K resolutions, effectively transforming the tablet into a game console. This is a game-focused device — it's just not as obnoxious about it. Strip away the $59.99 Shield Wireless Controller and the $39.99 Shield Tablet Cover, and you've got an incredible $299 Android tablet. Remove the game controller from the now $199 Shield Portable, and you've got a broken Shield Portable. For the past two weeks the Shield Tablet has been my only tablet. Normally I've got my iPad Mini nearby for gaming and e-mail purposes and my 8.9" Kindle Fire HDX for reading comics and watching streaming video. Instead, I've been all about the Shield Tablet. Playing games, streaming games via the tablet's native Twitch functionality, setting up the tablet as a console hooked to my television and using GameStream to play PC titles running on my gaming laptop — I've put the Shield Tablet through its gaming paces, and I've been largely impressed. Beyond gaming, I've been using the Shield for every day tasks — checking email, taking notes with the included passive stylus, catching up on The Killing on Netflix and reading comic books on a slightly smaller screen than I'm used to. I even took the Shield Tablet with me solo to a recent convention, where that passive stylus I just mentioned justified its existence a dozen times over. I've gotten more use out of the Shield Tablet over the past two weeks than I've gotten out of the Shield Portable since it was released last year. That's how much of an improvement we're looking at. An Excellent Tablet: The Shield Tablet is a device designed for gaming, yet it works so well when it's not. Pure Android KitKat slides smoothly beneath the fingers, backed by a Kepler GPU with more power than anyone is going to need for at least a couple of years. Dual front-facing speakers ooze gorgeous sound. It's got a micro SD slot to expand storage from 16GB (WiFi) or 32GB (LTE), a hidden stylus that proves more useful every time I remember it's there. All of this house inside a solid but not bulky 13.7 ounce frame, with that lovely soft plastic finish on the back that's a joy to touch. If the Shield Tablet were simply an Android tablet, devoid of any extra gaming bells and whistles, it'd still be the Android tablet I'd buy. Trine 2: Complete Story, which comes pre-installed. There's a certain look and feel to mobile games which completely disappears when the Shield Tablet is running one of these games. It no longer feels like a tablet trying to be a console — it just feels like a console. Unfortunately, as has been the case with most of Nvidia's Tegra chips, it'll be a while before K1 optimization is a big enough deal to generate a large library of games — honestly it may never happen. But when the graphical effects are flying and the tablet starts to heat up, these games sing. Streaming PC Games: When your router is sufficiently stocked with dual-band power and your PC incorporates the latest Nvidia graphics cards, then you may mirror your games on your Shield Tablet, controlling them with your Shield controller. As with the Shield Portable, many stars have to align to make the GameStream technology between your PC and the Shield Tablet work just right, plus you're going to need a place to perch the tablet stand. The upside is, it works so much better on the 8-inch tablet display than it did on the 5-inch portable screen. Overall, this is a much more sensible way to enjoy the functionality. Those Speakers: I love front-facing speakers on tablets. Some folks see those lines of dots and feel they ruin the aesthetic or take up too much space, but not me. After years of cupping my hand about the bottom of my iPad so I could actually hear anything, those little rows of dots are more than welcome on the front of anything I might be playing games or watching movies on. It just so happens these dot rows are rather loud and clear, which is always a plus. They're the sort of holes that welcome friends to gather around the screen. Maybe they'll bring popcorn. The Controller: The Shield Controller is an optional piece of equipment, unless you're buying the tablet for gaming, in which case it's not. Technically you could purchase any number of Bluetooth-capable game pads to get the job done (a PlayStation 3 controller, perhaps? ), but few would be as near-console-quality as this one. Better than Amazon's Fire TV controller, certainly better than most third-party console peripheral makers, the Shield Wireless Controller feels nothing like the toy I figured it would be. It's got the standard buttons and triggers, along with Android-specific controls and a nifty little touch pad at the bottom for when you'd rather have a mouse. The Cover: I'm not a fan of folding, flopping, cover-style cases for my delicate electronics, and the Shield Tablet Cover is fold-ier and floppier than most. I'd much rather outfit this fine piece of equipment in the equivalent of plate armor and pick up a universal stand for gaming purposes than leave it exposed like this. If you look closely, you can see a bit of disappointment. It's not that I go out into the sunshine often, but I'd like to know I could still keep myself distracted when I did. Nvidia attempted to define Android gaming with the Shield Portable, and it failed. It failed because Android gaming had already been defined. Android gaming is, first-and-foremost, a rectangle that reacts to the touch of the players' fingers. That's what millions of people are enjoying every day, all over the world. You can add a game controller or a larger screen to the mix, but unless that core experience is present the appeal will be limited. With the Shield Tablet, Nvidia started with that perfect rectangle. It's the core of the product, ready to accommodate more traditional notions of gaming instead of being compromised by them.